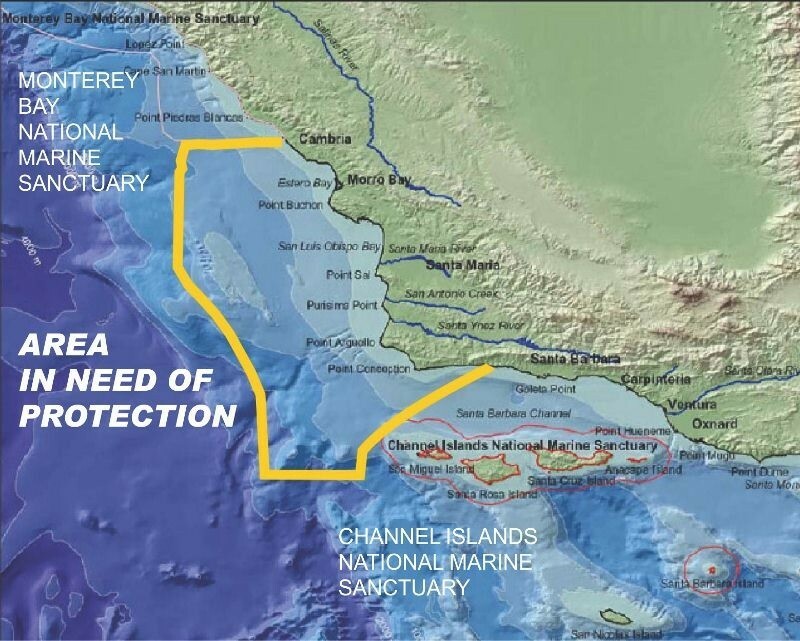 Bounded by the southern portion of Point Sal, north to the north the mouth of Arroyo Grande Creek and out a mile or two (actual western boundry needs further study), Area Four is located. An isolated kelp forest is found within the at the cove at southern portion of Point Sal. Lion Rock, 200 yards offshore, is a nesting place for cormorants and endangered Brown Pelicans and a haulout for pinnipeds. Six hundred sea lions have been counted at one time. The mouth of the Santa Maria River, one of the largest coastal drainages in California, is a Brown Pelican feeding area as well an a riparian habitat. Productive stocks of salmon, halibut, shrimp, and other species are harvested by commercial and sport fishermen. Intertidal invertebrate life is abundant on the rocky shores around Point Sal. During migration periods (December through May), large numbers of gray whales stack off Point Sal waiting for guide whales to navigate open water. The Nipomo Dune complex from Pismo State Park Beach to Point Sal became a National Natural Landmark in 1980. The landmark consists of two contiguous areas: 1) The Oceano — Nipomo — Guadalupe Dunes, the largest coastal dunes in California, which are fed by sand carried by offshore currents circulating in a littoral cell in San Luis Bay; and, 2) Point Sal, one of the last remaining pristine, rocky coastlines on the South Coast. Point Sal, a State Beach, no longer has access by paved road and thus the marine ecosystem is under less stress. The dune complex draws hundreds of thousands of visitor each year. It is one of the few California beaches where offroading is not only permitted but encouraged. The dunes have immeasurable ecological and scenic value along with educational, scientific and recreational importance and represents one of the few coastal areas in the state still in an undisturbed condition. There are beaches, headlands, estuaries, and lakes. Many plants are rare or endangered; a high percentage are endemic to the area. At least 186 species of water and terrestrial birds have been recorded, including the Least Tern, the Peregrine Falcon and the Southern Bald Eagle. Geologically, the region is complex due to periods of advancing and declining sea levels and to recent uplifting. The creation of dunes led to the formation of wetlands that have changed dramatically over the last 150 years by Spanish and American presence and action. The dunes, acting as a barrier to the ocean, had formed a freshwater bay which was drained by farmers in the mid 19th century. The movement of sand from land to sea is now hindered by dams; the dunes are thus dependent on sand already present in the San Luis Bay littoral cell. The drainages of four separate watersheds contribute to the wetland complex. The 1,880 square mile Santa Maria River drainage is one of California’s largest coastal river basins. Extensive, tidally influenced wetlands sit at the river’s mouth. The river’s historic flood plain holds the Oso Flaco Lakes and their associated coastal wetlands. The 10 existing dunes lakes are likely remainders of the freshwater bay. It has also been suggested that there once was an estuary mirroring the Morro Bay Estuary. The unique combination of semi arid and aquatic conditions with a climatic and oceanographic transition zone provides a wide variety of habitat and of associated plant and wildlife species. Coastal dunes, freshwater marshes, riparian habitat, coastal salt marsh, woodland, mudflats, beach, open water, and areas of transition between habitats provide a diversity of life uncommon to much of California. The wetland and ocean habitat supports an abundance of wildlife. Over 86 species of water- associated birds have been recorded in the wetlands of the Nipomo Dune Complex. Shorebirds, waterfowl, gulls, terns, pelicans, cormorants, coots, rails, loons, gerges, herons, and egrets are among those counted. Least Terns nest and raise fledglings near the Santa Maria River mouth and the Oso Flaco Lakes, Brown Pelicans roost at the shore, and Snowy Plovers inhabit the beaches. Over 100 terrestrial bird species occur among the dunes and related habitats. Among these are the endangered Peregrine Falcon and the Southern Bald Eagle. Nearly 50 species of mammals and 33 species of amphibians and reptiles inhabit the dune region. Though not in great numbers, fish are found in the lakes. There is a wide diversity of invertebrates. And the Pismo clam, subject of much recreational and scientific attention, is found along the beaches. Several significant Chumash village and foraging sites are found in Area Four. Near the Point Sal area are village sites. A variety of sites are found within the dunes and adjacent to its wetlands. Extensive shell mounds from thousands of years of clamming have been documented. Other sites line the old Pleistocene era dunes of Nipomo and Arroyo Grande above what was once a large estuary formed by Arroyo Grande Creek and the Price Canyon drainage. Several other sites surround the old estuary on its northern embankment. 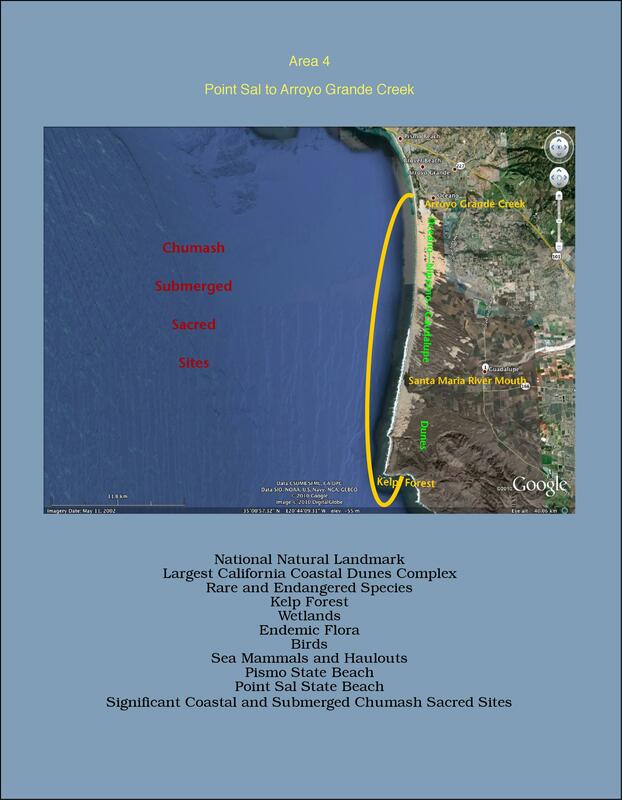 North, the Chumash village site at Pismo Beach has been dated to have been continuously occupied for 9500 years. An unknown number of submerged sites most probably located along older drainage systems dating back 20,000 years. Much of the artwork of the Dunites depicts their environment of the Dunes, ocean, and beach. 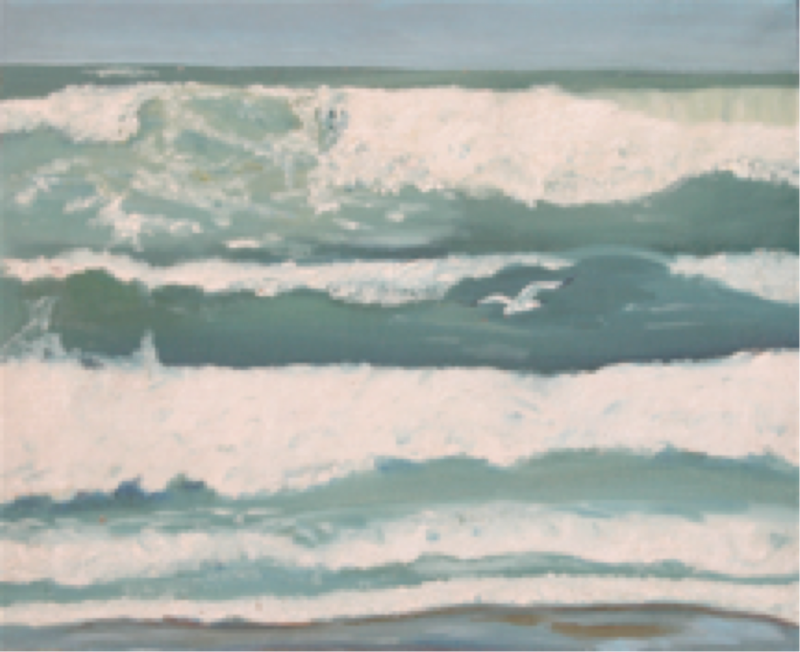 This painting capturing the mood of the ocean is by Dixie Paul, “Mrs. Robinson Crusoe.” She painted this while living in the Oceano Dunes with her two children. The large shell mounds and middens in the Dunes that stretch between Pismo Beach and Point Sal show that fish and clams from the Pacific Ocean were used extensively by the very first inhabitants of the area, the Native American Chumash. They made their appearance over 13,000 years ago, and were primarily a hunting and food gathering society. Their population dwindled rapidly after arrival of the Spaniards and the advent of the Mission system during the 1800s. Around the turn of the twentieth century a group of people known as The Dunites began living in the sand dunes of Oceano on a regular basis. The Dunes during that time became known by many hobos, free spirits, hermits, artists, writers, poets, mystics, spiritual seekers, and many others who came there to be alone and partake in the beauty and spirit of the Dunes. Wild edible plants could be foraged for, and vegetables could be obtained from the agricultural fields inland. Produce could be picked up off the ground at the Southern Pacific loading dock in Oceano during harvest time, where it had been culled out as being not quite good enough for the market. Best of all there was no rent and no taxes; one could salvage wood and lumber from the beach and with a minimum amount of hand tools they could build their own free style shack in the dunes. Wind Woven Poems by Edward C. St. Claire. Published by Halcyon Press, 1925. Very few copies of this volume of verse written by this early Dunite have survived. People of Atlantis by Dunite Arthur Allman, 1936 (unpublished). The pillars of Atlantis were believed by some to be under the sand dunes of Oceano. This account of Atlantis written in the Dunes by Arthur Allman is lavishly illustrated. Original copy with Ella Thorp Ellis. Wheel of Fire by Dunite Hugo Seelig with Foreword by Ella Young, Godmother of Moy Mell. Oceano Round Table Press, 1936. This book of mystical dune poetry was written by Hugo during the years he lived alone in the Oceano Dunes. Glory Roads-The Psychological State of California by Luther Whiteman and Samuel Lewis, 1936. A book about radical depression era politics in California with brief commentary on the Dunites. Whiteman and Lewis had both lived in the Dunes. Luther would later write Face of the Clam (a book about the Dunites) in 1947, and Sam Lewis went on to become one of the early Sufi leaders in America. Fairy Tales are True by Dunite and Sufi leader Bryn Beorse 1978. Hue Press, New York. A part of this book is set in the Oceano Dunes with tales about some of the people who lived there. Jeremiah Jairus by Dunite George Helman. Portions of this (unpublished) autobiography of over 1,000 pages describe George living in the Oceano Dunes off and on from 1927 through 1942. This newly discovered manuscript is in the Oceano Depot Association archives at the Oceano Depot. Flowering Dusk by Ella Young 1945. Ella Young was the Godmother of Moy Mell. This autobiography contains descriptions of the Dunes and stories about Gavin Arthur and other Dunites she knew. Ella also wrote many other books about Irish folklore and mythology. Face of the Clam by Luther Whiteman. Random House 1947. A novel about some of Dunites the author knew while living in the Dunes. Although this book is fiction, it provides an accurate portrayal of Dunite lifestyle. POEMS by Ellen Janson (with Foreword by Ella Young). 1952. Ellen lived at Moy Mell in the Dunes and was one of the poetry editors of the Dune Forum. Secret of the Dunes by Jane Elsdon 1986. Bert Schievink was an astrologer who lived as a hermit in the Oceano Dunes for 34 years. He was the last Dunite to live in the Dunes and became good friends with Jane and her husband. Jane was a poet and writer and promised Bert she would write a story about his life in the Dunes. A harp full of Stars by Joel Andrews. Golden Harp Press, Ben Lomond, CA. 1989. This autobiography by Joel Andrews (Gavin Arthur’s nephew) describes his spiritual journey in learning to heal with music. The Dunites by Norm Hammond, Published by the South County Historical Society 1992. ￼￼￼￼￼￼￼￼￼￼￼￼￼￼This book is a historical overview of the Dunites who lived in the sand dunes of Oceano. POEMS OF THE DUNITES by Norm Hammond 1994. A collection of poems that were written by the Dunites (out of print). Life with Uncle Gavin (42 pages) by Joel Andrews c. 2004. This (unpublished) book by Gavin Arthur’s nephew describes living in the Dunes at the Utopian colony of Moy Mell during the summers of his youth. A copy of this book is in the archives of the Oceano Depot Association. Ella Young-Irish Mystic and Rebel by Rose Murphy. A definitive biography on the life of Ella Young, godmother of the dune colony of Moy Mell. Published by The Liffey Press, Dublin 5, Ireland. 2008. At The Gates of Dawn- A Collection of Writings by Ella Young by John Matthews and Denise Sallee, 2011. This book provides further insight into the life of Ella Young. DUNE CHILD by Ella Thorp Ellis. Ella’s father Dunham Thorp worked as an editor of DUNE FORUM. This book has a number of historic photos of people at Moy Mell and stories about Ella’s dune memories while living at Moy Mell as a child during the 1930s. Other books by Ella that are set in the Oceano area are Riptide, Sleepwalker’s Moon, and Hugo and the Princess. GLOW International-A Journal devoted to Meher Baba article, “Mystery of the Dunites,” February 2005. This issue of GLOW has a comprehensive 19 page article by Valerie McKean about Meher Baba at Moy Mell in the Dunes in 1934. The article also features a recently discovered article written by Gavin Arthur about Meher Baba that was scheduled for the last issue of DUNE FORUM just prior to its failure. In this article there are several photos of Dunites and the people who accompanied Meher Baba when he visited Moy Mell.